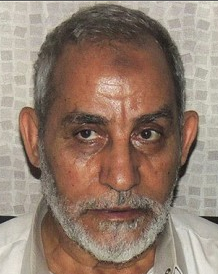 24 Aug 2013 Gomaa Amin is understood to have been made head of the Islamist organisation last week following the arrest of his predecessor in Cairo by Egypt’s military rulers. Mr Amin, 79, had flown to London about two months ago for medical treatment and as a result escaped detention when the army seized power in a bloody coup. He is now residing at an undisclosed address from which he is trying to orchestrate the Muslim Brotherhood’s response to the coup. The presence of Mr Amin in London is a potential headache for British authorities who may be obliged to provide protection for such a senior and controversial figure. The Muslim Brotherhood supports a caliphate, a unified Islamic state under Sharia law, and has been accused of fuelling religious tensions in the Middle East, particularly with the Christian minority. Attacks on Christians in Syria and Egypt are highlighted in a new interview with Lord Sacks, the outgoing Chief Rabbi, who spoke of his grave concern for the religious minority. ‘I think this is a human tragedy that is going almost unremarked,’ Lord Sacks says in an interview with the Telegraph. ‘I don’t know what the name for this is, it is the religious equivalent of ethnic cleansing. We are seeing Christians in Syria in great danger, we are seeing the burning of Coptic churches in Egypt. Lord Sacks’s comments – while not directly aimed at the Muslim Brotherhood which describes itself as a non-violent organisation – will turn the spotlight on the Brotherhood’s Egyptian leaders, who appear to be making the UK their base in exile. There will may be concern that Mr Amin’s residency in London will attract militant Islamists. In the 1980s and 1990s, Britain largely operated an ‘open-door’ policy allowing extremists to live in exile in London to escape persecution from authoritarian regimes in the Arab world. So-called ‘preachers of hate’ including Abu Qatada, Abu Hamza and Omar Bakri Mohammed used London as a base to radicalise young Muslims, who went on to commit or attempt terrorist atrocities both here and abroad. The GMBDW reported last week that that Dr. Mohamed Badie had been arrested by Egyptian authorities and was to have been replaced by Deputy Supreme Guide Mahmoud Ezzat. Subsequent media reports denied that Ezzat had taken Dr. Badie’s place.